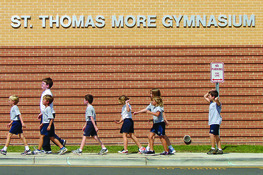 Lands' End is the only approved retail option for St. Thomas More Catholic School uniforms and can be accessed via their website at www.landsend.com. Five percent of all uniform sales at Lands' End return to the school to fund faculty development and continuing education. 3. create a free account on the website (username and password); part of creating this account is the input of information about your child's gender and grade level; you can add as many students (gender and grade level) as necessary; having this account means you will receive information from landsend about frequent sales, free shipping, free logo sales... Lands End does not share customer information with other companies.